Today is so-called memorial day where memories of the fallen are re-enlived. Flags are flying on the various military cemeteries and there are speeches being held and ceremonies being enacted. It is an American celebration. We never had anything like it in Great Britain, although 11th November is always celebrated as the so-called armistice day to commemorate the fallen in the last two world wars and the end of the war. World wars? Yes because the whole world was involved. Even neutral Switzerland had her soldiers at the borders to protect their own people. My dad was no hero, but no-one asked him to be a soldier. He was given an order by his country to appear at a certain time and date to enlist in the army. He was a young man, but orders are orders and he eventually found himself on an amphibious craft landing on the beach at Salerno in Italy according to his story. He learnt to love Italy, the wine and the country. He found it a shame they were at war. He also got to see Egypt with the pyramids and sphinx and a country that he always called Palestine, although it eventually became Israel. Dad was one of the old school and names never really changed for him. He told us of being in an army cantine in Italy when Beniamino Gigli, the great Italian opera singer, entered with his daughter and sang a few arias. Engish soldiers were enthralled, although not exactly opera fans, but this was something different to patrolling in dangerous areas. During the Gigli concert the military police locked the doors and inspected the soldiers papers that were now trapped in the cantine. Dad said there were many arrests made that day for deserters. He told me of marching in Italy when the ground suddenly caved in and below was a wine cellar containing the farmers store of Italian wines. He said there was not a sober man in the regiment after they found the liquid treasures. He was heading for France, Paris, when the war ended and saw the Eiffel Tower. Their money was allied money, in billions due to the inflation, but they were not rich. According to dad’s stories of war, you could imagine it was one big holiday for the british soldiers. It was only when I was older, married and had children of my own, that he would tell me about a march where some of his colleagues trod on a mine and were killed in front of him. About when he was climbing a mountain slope in Italy and German snipers were firing with their rifles. He said luckily they were climbing with mules and could hide behind the mules as they were being fired upon. My dad’s only war injury was when he dropped a shell from a gun (he was in the heavy artillary) on his foot and was lucky that the ground was soft mud and his foot sank into the mud instead of being crushed. He had a couple of malaria attacks in Italy and said that is not an illness he would like to go through again, shaking from the bouts of fever he had. Dad came home on a Friday, was married to my mum the next day in his army uniform because he had no other clothes to wear. He had only seen mum for a few hours one evening when they met in an english pub whilst he was on leave. Their romance developed by letter. This might not be the story of a war hero, but my dad was my war hero: Albert Stanley Relf 1915-2016. 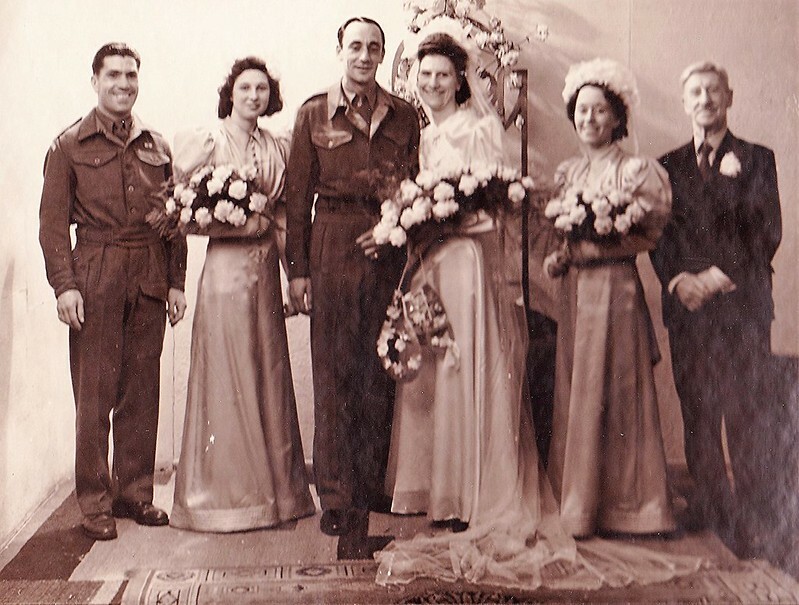 Mum and dad’s wedding photo. Her brother on the left, also in uniform, returned home after 4-5 years prisoner of war. On the right my grandfather, mum’s dad. Second on the right my mum’s sister-in-law and also school friend who married mum’s brother. The other lady is a friend of mums. I’m very touched and moved by your retelling of your Dad’s service in WWII. My Dad was my hero to me, my Mom and brother also. Dad was served in the Korean War in the U.S. Air Force. After he got out of the Air Force he got a job at Wright Patterson Air Force Base in Dayton, Ohio where he met and married my Mom. All our stories are important and we should never forget what previous generations went through to ensure the Freedoms that we have today. I Salute your Dad and mine. I think my dad was the typical soldier that had to do it. He was no hero, but no-one asked and so he did it. I was always asking him “dad what did you do in the war” and he always told it in a joking sort of way. It was only when I was older that I realised how it really was. Dad really only told me the funny stuff. Yes. True. That’s often the way of men who have been in battle. They don’t want to upset their children. However once grown then we realize what they went through. Thanks for sharing such a lovely story. My father also didn’t talk about the war until we were adults and now he frequently recalls his days in the army (mostly about his escape from the Russians) and how so many of his friends were killed by sniper bullets. He certainly has nine lives if not more. I’ve lost count. Russia was hard and many soldiers disappeared there. I am sure my dad could have told me a lot more. He certainly got around in Eueope. I remember some of the letters he wrote to my mum during the war. It was all censored and most of what he had written was blacked out, especially when he spoke about the areas where he was stationed. This was wonderful to read. My uncles went through stuff in the war — both stationed in the Pacific, one in China and the other near Guadalcanal. My dad, however, his war was pretty much spent in California. He was only 17 when he enlisted and pretty immature. The training he got led to his future career. America fought their war more on the Pacific side, the brits were more concentrated in Europe, although some were also sent to Africa and Japan. My friends father served in the medical core in the deserts of Africa. We were a lucky family that all the men that fought at the time all came home again. Many did not unfortunatley. My dad passed away at the age of 100 years and 7 months in 2016, he was probably one of the last that served in the last war. A 100 years. Wow. You had a nice long relationship with your dad. You are truly blessed. My ad was a medical resident when Pearl Harbor was bombed. The next day he volunteered for the army, and 3 months later he was sent to Africa and Italy for the next 3-1/2 years, leaving behind my mother and me — 1 week before my sister was born. He returned, but never talked about the war in our presence. My dad was just an average soldier if that exists and he was in a Welsh regiment. They needed three men to complete the regiment and my dad had two good collegues and they wanted to stay together, so they all volunteered for the regiment and stayed together throughout the war and the friendship continued after the war. I was a baby boomer of course. Very lovely story! You are blessed to have such a hero in your life. Thanks. My dad and my uncles were all heroes. That was a truly beautiful story. Thank you for sharing it. There are many heroes … and we so rarely hear of them.